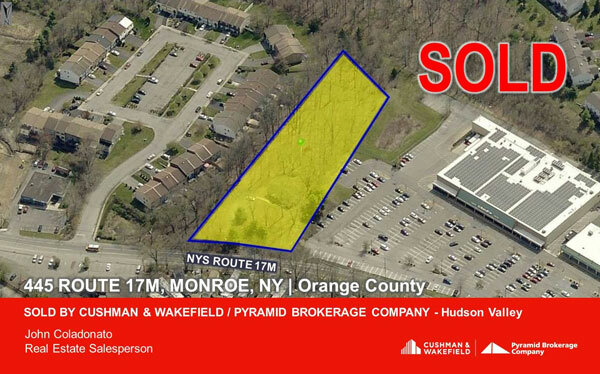 FEBRUARY 2019: Acting as the sole broker for the sale of the property known for decades as Alvin Gutz, CPA, located at 445 NYS Route 17M, Monroe, NY, John Coladonato of Pyramid’s Hudson Valley office, successfully closed on this sale to another accountant as purchaser. Said Coladonato, “I have known Mr. Gutz for many years. He ran his business at this location until he passed away. It’s great to see another CPA group purchase the property to continue with the same use. ” According to Coladonato, the new owner has future plans to build a professional office building with additional office space to be available for lease. The 1,800 SF building sited on 1.8 acres sold for $550,000. In the past, Coladonato has successfully closed on several other landmark properties in the Monroe area including Monroe Farm at 687 Route 17M, the former Hudson Valley Power Equipment at 1017 Route 17M, the former Monroe Ford property at 325 Route 17M, the former Mr. Cone property at 514 Route 17M, and 1 Freeland Street, Monroe.